KIEV, Ukraine -- A young Ukrainian artist has captured global media attention by creating a striking portrait of Russian president Vladimir Putin out of 5,000 bullet shells collected in the separatist east. The Face of War stands more than two metres tall and dominates the artist's studio apartment. 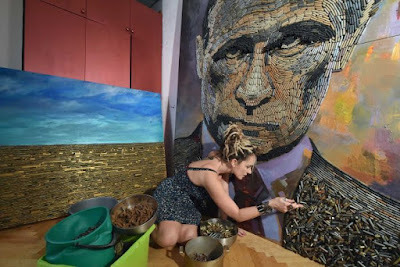 Daria Marchenko's The Face of War - a realistic and politically tinged depiction of Putin in a dark suit and red tie - stands more than two metres (6.6 feet) tall and dominates the artist's studio apartment. "Sleeping in the same room with him was a bit scary at first. But I got used to it," the 33-year-old artist and graphic designer said. The 62-year-old Russian leader's face changes expression under different light, his deep-set eyes turning from gloomy to more light-hearted. Marchenko - her own right eyebrow pierced and fingers weighed down by heavy metal rings - demonstrates by drawing the window curtains and shining a hand-held lamp around her work. "He can be proud, confused or serious," she said. "He can look like a person on a Soviet poster or he can be Superman." Her story has been covered by Britain's top media outlets and major European and Australian papers and television channels. But the artist has received barely a mention in Russia - Ukraine's giant neighbour where Putin's approval rating is huge and denial of any involvement in the 16-month conflict is ever-present in the state-dominated media. Only Russia's popular Moskovsky Komsomolets broadsheet broke ranks by devoting a two-sentence paragraph to Marchenko's work last month. Marchenko has not concealed her deep-seated suspicion Putin personally instigated a conflict that has killed nearly 7,000 people since breaking out after Kiev's ouster of a Kremlin-backed president. "When people see his expression change, it reveals certain things," she said. "To me, this war is different from all others because it is built on a lie". Her first handful of shells came from her boyfriend, an active member of the Euromaidan movement that toppled the corruption-stained and deeply unpopular president Viktor Yanukovych and forced him into self-imposed Russian exile. But her art supplies now come from friends fighting across the war zone in eastern Ukraine's industrial heartland. "A bullet shell is a symbol of an interrupted life," she said. "The world does not realise just how much my country has lost. "So this desire to work with more and more shells came naturally." Putin's portrait is the first in a series entitled The Five Elements of War. Two others - to be possibly constructed out of weapons or other battle remnants from the devastated front - will be dedicated to the "heart and spirit" of warfare, Marchenko said. Another might be called The Brains Behind the War but she said the final work's title was still a secret. "Unfortunately, war gives artists like me a lot of material to work with," she said. Putin has often denied paying much attention to the media or thinking about his historic legacy. But Marchenko said she was certain the Russian leader - more and more portrayed as a hero in Moscow's art galleries - had already seen images of her work. "I might be too naive, but I do hope that he at least thinks about it and asks himself whether this is how he would like to be remembered," she said.